By the end of this post, you’ll have gained a close and personal insight into the many benefits and uses of this multi-cooker. I purchased this particular Fagor Lux model to use primarily as a pressure cooker last year online (we got ours through Amazon), so I’m excited to finally write down the time saving and convenient features that you can enjoy as well. 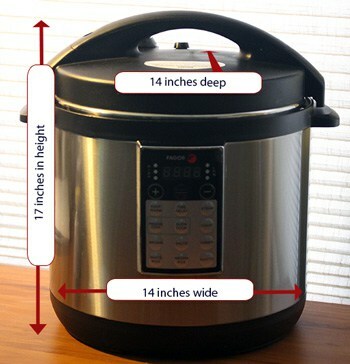 My multi-cooker/pressure cooker has helped me prepare some awesome meals quickly and with no stress! (Check out my video at the end showing how to prepare a whole chicken in less than an hour!). Probably like you, I’m super busy and just simply don’t have a lot of extra time on my hands so this is pretty much a set and forget appliance that fits me and my lifestyle. This means it operates by plugging it into an outlet using the cord. Just the mere mention of the word pressure cooker (which is what this is often loosely referred to as), people conjure up horrifying images of exploding and hazardous pressure cookers that would build up pressure by being heated over the stove. 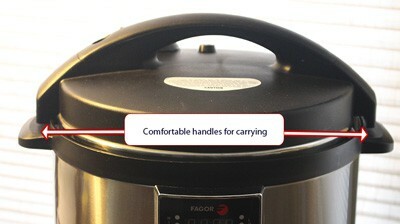 Fagor has done a great job at making these safe and easy to operate. I personally would never use a stovetop one simply because I get too distracted and it would be a disaster waiting to happen! 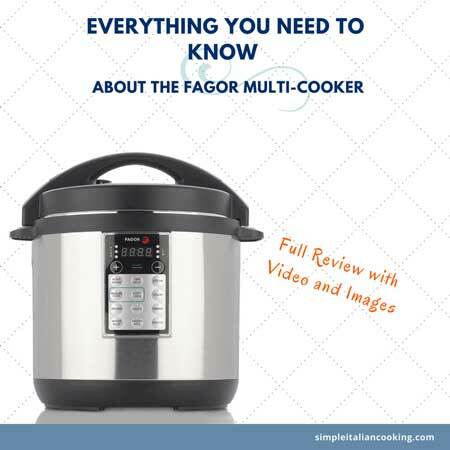 Is the Fagor Electric Multi-Cooker Easy to Use? In a nutshell… yes it is. If you can’t tell by the name of my website (SimpleItalianCooking.com), I’m all about simplicity and easy. People think I must be an amazing cook to have a cooking site, but the truth is, I just try to only deal with simple. And that means the tools and appliances I use have to be simple too. The front panel has 6 touch buttons for different functions that are easy to operate. If you purchase any recipe books for electric pressure cookers, they will tell you any specifics that you need to know for how to cook or prepare that particular recipe. So don’t expect to memorize every little tip you read, people who share recipes will explain anything that you need to know when using a pressure cooker. I’ve included some tips below that will help you become more comfortable with the unit. These are tips that not only Fagor provides, but that I also found very helpful which I would make sure to tell even my own mother. Why is it Called a Multi-Cooker? Although most people refer to it as a pressure cooker, the one I am writing about is technically a multi-cooker. That’s because it cooks a variety of foods in a variety of ways. It operates as a slow cooker, a pressure cooker, a rice cooker, and even a steamer. It also can be used for browning foods like chicken or roasts. The multi-cooker comes in 4 quart, 6 quart and 8 quart sizes. This is based on the size of the inside removable pot. My husband and I purchased the 8 quart for just the two of us, and I’m very glad we did for the extra money. The reason is that with the smaller sizes you are limited to what you can cook. I can fit a 4 lb. chicken in our 8qt to brown but it wouldn’t fit in a 4 qt at all. Keep in mind too that you can’t fill pressure cookers 100% of the way because you have to allow for two factors depending on what is being cooked. There has to be room for the pressure to build up. If there isn’t enough room because you overfilled the pot, then your food will not cook properly. What a pain. Secondly, if the food is a type of food that expands as it cooks such as pasta or raw beans, then you are only supposed to fill it up no more than ½ way, otherwise it too will not cook properly. So taking those factors into consideration, you can see why you can’t say, “I never cook anything that equals 8 quarts”, because that’s not an accurate way of measuring your food quantity. Well as stated above it comes in a variety of sizes, from 4, 6 and 8qt. The one we have is 8 quarts and it’s 14 inches deep by 14 inches wide and 17 inches in height. I’d recommend looking at the product specs on Amazon for the exact sizes of the 6 and 4-quart models. It fits easily on the counter and there is no issue with the cabinets above it getting in the way. I prefer to keep it lower just because it’s easier to move around by lifting with the handles. 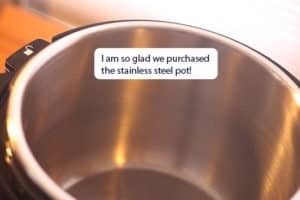 My husband and I purchased an additional stainless steel bowl to use as our primary (we prefer stainless for cooking), but also for times when we need to really crank out the food and could use a second one to easily replace the first one. Is it necessary? Probably not, but useful. When you purchase the multi-cooker, by default it comes with a non-stick ceramic pot which is nice for recipes like rice or risotto. However, for recipes that require browning, it is good to have a stainless steel pot for better results. Obviously it pressure cooks. As with most pressure cookers, this means it can save you time by up to 70% (yes, that figure is direct from the Fagor product manual and website). The types of food you can cook in a pressure cooker is surprisingly wide-ranging. You can cook desserts like brownies and cheesecake, meats, roasts, pasta, soups, stews, rice, stock, and even yogurt! There are a bunch of good pressure cooker recipe books and I recommend getting at least one or two to keep on hand. They will include specific settings and instructions and I’d have been lost if I hadn’t had mine! So far it’s cooking a whole organic chicken. I used to almost always over-cook my meat, as I never trust the whole, “once you take it out of the oven it will keep cooking a little”, so I always leave items in too long. I love whole chicken. I love it because it has so many uses from chicken stock to sliced chicken sandwiches to rice and chicken dishes. So getting it right, is important, and with this pressure cooker it comes out perfect each time. With the pressure cooker there is no stress because I follow the same rules every time, set the time, and I get perfect results, plus awesome stock when you add in some veggies. You can actually watch at the end of this review a video I spontaneously put together about how I had to make a meal within an hour for my in-laws. I couldn’t have done it without my pressure cooker. The only time I had chicken that was too dry was when I was new to it and didn’t trust the instructions in the Great Food Fast cookbook I had purchased. Silly me thinking I knew best. When I do the recipe as I’m supposed to, it’s perfectly moist meat, including the breast every single time. I love it! However, one thing to note is that you will not get a crispy crust like you could if you roast it with tons of olive oil and butter in the oven. In the cooker, you will brown the chicken, but that’s in my opinion more for searing and adding flavor. I just remove the skin before serving as it comes off super easy. However, as one who likes the crispy skin even though it’s not supposed to be healthy for you, I still chose the pressure cooker version. This pressure cooker/multi-cooker has a rice cooker setting. I don’t use it much because to be blunt, I forget about it. But when I did use it a few times it came out a little on the wet side, but that may be I just need to adjust liquid levels to accommodate. I will say however that I have used risotto and it’s been awesome. There is actually a risotto setting button which you can use. I made a risotto barley recipe and used the regular pressure cooker setting per the instructions given and it came out great. I saw in the manual that it says not to do pearl barley, however my barley cooked fine and I’ve seen tons of pressure cooker recipes for it. So it may be an issue if using a smaller version pressure cooker since barley really expands in size. But that is just a hunch, and not to be taken as a definite. One tip is that by adding a drop of olive oil to items that tend to foam when cooking can keep that foam down so it doesn’t become an issue with any overspill into the reservoir. I’ve personally have not had that experience. This is one setting I have not used as of yet. I have planned on it so many times, however I’m not a planner when it comes to cooking. Oh I talk the good talk about setting a food schedule and using Sundays to write out the week’s meals… but I can probably count on one hand the times I’ve done it. However, I’ve read other reviews to see what other people’s experiences or thoughts are about the same cooker I have and I haven’t read anything negative about using it as a slow cooker. It’s pretty cool how it works actually. 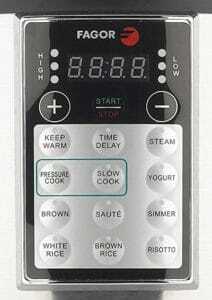 You can set the slow cooker to cook for up to 9 ½ hours. In terms of operation, it’s pretty much the same as if using the cooker for pressure cooking except you put the steam valve to STEAM rather than pressure. Follow the recipe instructions and you’re all set. 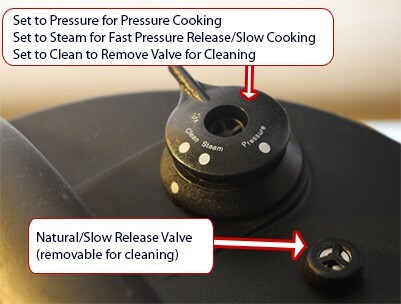 As you can see in the image, the pressure valve is easy to use and very simple to understand. When using the multi-cooker as a pressure cooker, turn the dial to Pressure. If using the multi-cooker as a slow cooker, set it to Steam. 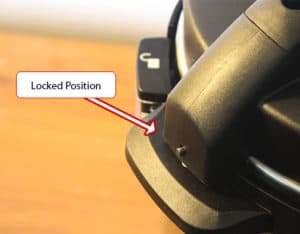 You also use Steam do a quick release at the end of a Pressure cooking session (unless it calls for a slow release in which case you don’t perform a fast release, instead just leave it at the Pressure setting. 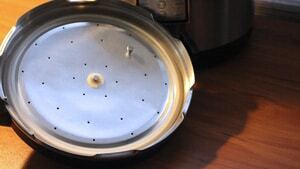 Turn the dial to Clean when you are ready to clean the pot and lid. The valve will pull right out when in the Clean position. The time delay is pretty cool too because you can set it up to 8 ½ hours ahead of time. Just think, you can get your items together the night before, start the delay to end by morning and start slow cooking for the day. However, keep in mind that you should not use long delays for perishable items like meats or eggs. Things that you wouldn’t normally leave out anyway. This feature would come in very handy on holidays when cooking multiple dishes and you just want to get it ready a little bit early. No big deal, even at 30 minutes delay it’s a huge help when you’ve got your hands full with other recipes that need your attention. The Keep Warm functionality is nice because you can use it manually by using the button on the front panel, or you can use it at the end of the cooking when the pressure cooker changes to that setting automatically when finished with its cooking cycle. By automatically switching the multi cooker to the keep warm cycle (which has no time limit), the cooker keeps your food warm. On one hand, this is really nice, because I’ve read complaints from people who used other pressure cookers that didn’t have that feature and their food would go cold. My personal take on this is that it can keep food too warm depending on what you are preparing. For example with my risotto, I’ve had it over-cook and not turn out because I kept it in there to “keep warm”. The risotto dried out and lost its creamy-ness. However, on the other hand, for items like soups and chili where you don’t have to worry about over-cooking, it is super handy and in that regard, it is actually very nice. So some of these issues I think are just normal issues regardless of which brand pressure cooker you purchase. The more you use it the more you’ll have those “Ah-Ha That’s Awesome!” moments. I’m not a fan of heavy clunky appliances. This one is kina borderline. The unit itself weighs 17.5 lbs. which for 8 qts really isn’t heavy per se compared to our KitchenAid stand mixer which I can’t stand moving. However this multi-cooker does weigh more than my automatic Phillips pasta maker. I’m a petite person and I don’t want to incorporate moving heavy appliances as part of my workout! If this was too heavy for me, I’d leave it alone on my counter. Right now, it currently sits back in the corner and I pull it out as needed. It is very comfortable to carry thanks to the handles on the side. So moving it around the kitchen is fine once I pull it out from behind my other appliances. Don’t attempt to carry it by just holding the lid handle. That is for operational use, not carrying. First, let’s talk about the lid and how to clean that. The lid is made of two large parts which separate with a simple tug using the metal post shown in the image. You can also remove the rubber gasket as shown below. This is important because we didn’t realize this for awhile and would pretty much soak the lid to try and get it clean. It was my biggest gripe until I learned how it actually works! So you really want to take it apart to make sure it gets nice and clean after each use. The pressure valve also can be taken out to clean and that’s easy enough. Just twist it to the clean position and lift out. When you put it back just line everything up and push it in. It can line up two ways so if one way doesn’t work, just use the other notch and it fits in. You’ll know what I mean if you buy it. The parts unfortunately CAN NOT be cleaned in the dishwasher. The removable inside pot however is dishwasher safe. When I first mentioned to both my mother and my mother in law we had gotten a pressure cooker, they both gave me looks as if I were crazy. They pretty much both said each time, “Oh you won’t like those, they are so dangerous!”. That’s because they were thinking of the old style stovetop pressure cookers. These are electric and you plug them in and with the Fagor models they have a very sturdy lid that has a lock and unlock position. I’ve included some images to show you. 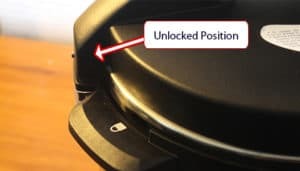 It’s so easy to operate, and as a safety precaution the unit will not allow you to Unlock the lid until the pressure has decreased enough to be safe. I never used stovetop pressure cookers, and I’m so glad. I think I’d still be having nightmares due to the fear of them exploding. These modern electric pressure cookers are much safer and I feel completely fine using it. However, that’s not to say there aren’t precautions a person should be aware of or they can get seriously hurt. 1) This isn’t for kids. The cooker gets hot to the touch on the outside and should be left alone during and after the cooking until it’s cooled down. 2) When you release the steam using the pressure release valve, the steam that comes out is HOT. I use a dish towel or potholder to open it so no steam will accidently hit my hand or fingers. I’m always tempted every single time to just open it and take a chance, but every time I take precautions I am always happy that I played it safe when I see and hear the massive burst of pressure being released. 3) Although the lid stays in lock position until the pressure is released, there is still hot condensation on the bottom of the lid which drips when you take it off. So make sure to remove the lid at a tilt to let the condensation drain off back into the pot, and not on you. Just a simple tip that really becomes second nature to remember. In addition, by tilting it your hand/arm is protected from any steam that might come up from inside the pot. 4) Never try to force the lid open while it is under pressure. I have never tried this, nor would I. So I’m assuming that to do so would cause serious harm if you were able to open it somehow. I can’t think of a single time I would have had to open it after it’s been cooking unless I forgot an ingredient. Which in that case, if it’s still building pressure then that would be fine to release the pressure then add the ingredient and put the lid back. You would be adding more time to the overall cooking time due to the delay, but at least the pressure cooking hadn’t started yet. 5) Always use at a minimum of 8 oz. of liquid regardless of what you are cooking. This was a big one for me when I started using the pressure cooker because I was so new to it all. I was always afraid I wouldn’t put enough water in, like if I was just cooking some chicken breasts for example. So knowing at least a minimum of 8 oz. when the recipe doesn’t call for a specific amount helps to know. 6) Remember never fill the pot more than 2/3rds full (there will be markers on the inside of the pot), and for items that expand like pasta and beans, never fill more than halfway. 7) If cooking fresh fruits, use the low setting. Don’t use High pressure. 8) When using the cooker, you are better off using tougher cuts of meat that are actually less expensive. The reason is simple, for slow cooking the fibers will break down over time and that’s why roasts are so awesome and tender. However with pressure cooking the fibers still break down under the extreme pressure and the meat still turns out tender. 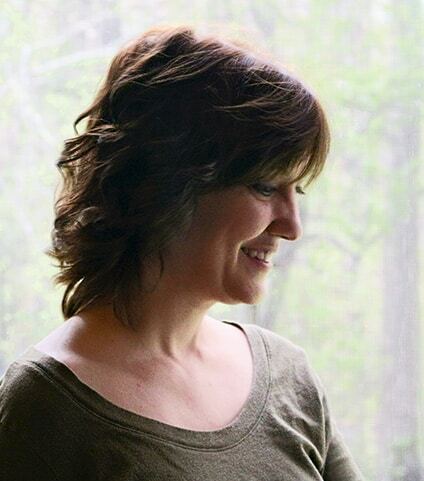 It’s very cool and is very helpful to know for practical and financial reasons! 9) Don’t deep fry with this cooker. It’s not a deep fryer so don’t attempt to use it as such. According to the manual which you can find here, Fagor offers a limited warranty for 1 year. I think they should increase that, but I have seen talk about an extended warranty option, however cannot find information on that at the time of writing this. 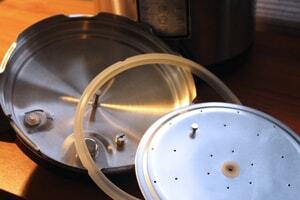 To order replacement parts, I’ve seen some at which brand pressure cooker you purchase that goes around the lid (see image above). You can also call their customer service at 1-800-207-0806 between the hours of 8:30 am and 5:30 pm EST and ask for “Customer Service”. The item number is #670040230” according to the manual. The biggest complaint I have found is that the unit can stop working due to the electronics. Again, I haven’t had any issues, but if I did I’d be demanding a replacement right away and would encourage you as well. Anytime when dealing with electronic appliances there will be malfunctions that happen prematurely on products. I have an electric stovetop and have had our electric panel replaced thanks to our extended warranty over 5 times! So I’m not defending anything, but it is a reality with electronics. If you get a bum one, let them know immediately. We purchased ours online through Amazon. We have Prime membership so we got ours super quick with free shipping. I love prime and it’s more than paid for itself as we order almost everything through Amazon including food items, and love their easy return process. Here’s a direct link to the particular Fagor pressure cooker that I use and that you can see in my video. Pressure Cooker Saves the Day When Running Late for the In-Laws! Here’s a video I made spontaneously about how within an hour I used the pressure cooker to cook a whole chicken while I used the oven to roast potatoes for my in-laws – yes in less than an hour!